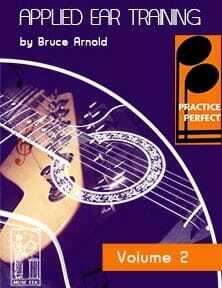 Practice Perfect™ Applied Ear Training Volume Two Today! Status: In stock, Digital book is available for immediate access. The Practice Perfect™ series of books provides multiple ways for a musician to hone their skills through exercises that teach using real time application within a music environment. That is, these exercises place a musician in a real live music situation simulating the contexts most associated with performance. The musician who participates in the the Practice Perfect™series MUST follow the directions in the proper use of the audio files. The musician participating in the Practice Perfect™ series of books MUST understand the importance of “context” when learning. The musician participating in the Practice Perfect™ series MUST understand the cognitive skill sets needed for effective learning. The development of Practice Perfect™ skills involves all aspects of playing music; ear training, physical technique on your instrument, and development of basic to advanced rhythm skills should also be in the mix as you work to perfect your musicianship. You may need other books from Muse Eek Publishing Inc. to master all of these skills. Please get in touch if that is the case. I often recommend other publications to use to strengthen some aspect of a student’s musicianship. Many of the Exercises in the Real Rock Ear Training tracks are in minor key centers. This will be of particular help to musicians that have problems with minor key centers. Most of these Real Rock Ear Training tracks are around 2-3 minutes in length. Each Real Rock Ear Training track has three different audio files. These tracks use either a soprano, alto or tenor voice which sings the answer. Most Real Rock Ear Training tracks are over a single harmony with a few exceptions. Some Real Rock Ear Training tracks have moving fast moving power chords which are usually more difficult for beginners but are excellent for intermediate to advance ear training students. All Real Rock Ear Training tracks are stylistically related to the rock idiom. If you play an instrument have the instrument at hand even if you don’t play it as you do these exercises. Just its tactile proximity will make you think of how an exercise relates to it. If you can play along with the audio tracks and also sing the notes when prompted will greatly increase the exercise’s effectiveness. a. Try practicing in different rooms of your house. b. Try practicing these exercises with other musicians. c. Try practicing these exercises in front of other people. d. Try practicing these exercises at different times of the day. 3 page PDF giving ideas and suggestions for practice. This entry was posted in Bass Guitarists and tagged Practice Perfect™ Applied Ear Training Volume Two, rock Ear Training by Muse Eek. Bookmark the permalink. Muse-Eek Publishing Company is a publishing house with a broad focus on music education. Muse-Eek also publishes fine art and poetry books, and has its own record label, Muse-Eek Records. Our online presence, Muse-Eek.com specializes in the publication of music workbooks, video courses and sound and video recordings that teach the foundation of good musicianship through groundbreaking and innovative methods along with traditional methods that have been taught for centuries. These historic methods date back through centuries of great musicians and educators. To see these interesting relationship please see Bruce Arnold's Music Education Genealogy Chart which tells you a lot about the where many of his educational ideas took root and some of the educational pillars that are evident throughout the books you find on this website. The Muse-Eek Records catalogue contains a diverse selection of music much of it by Bruce Arnold in collaboration with some of today's best players in classical, jazz, rock and avant-garde music. These are available in CD, DVD and mp3 formats. We believe in a working relationship with our music education customers; they are free to interact with the author after purchasing a book to help them through any material they don’t understand or which they need further clarification. We also have a member's area which contains a wealth of free information to help a student understand music at a deeper level and access additional files for our books. Many of our books offer cutting edge ideas regarding ear training, guitar technique, rhythm and time. These methods have a proven track record. Our main author Bruce Arnold has taught at some of the most prestigious music schools in the world, including Princeton, Dartmouth, Berklee College of Music, New England Conservatory, The New School and NYU. Along with Mr. Arnold's publications on the Muse-eek.com website he has also written books and appeared in educational DVDs for MelBay and Truefire. Over the years Mr Arnold has used his experiences with his students to develop a program that can elevate a musician's ability to world class caliber. If you have questions about any of our books or recordings please send us an email. Along with general questions about either our record label or our publishing company we also welcome questions to help a student choose the proper materials to reach their goals. We have over 300 products to help you learn any style of music and to develop your musicianship to its peak. We also make recommendations for practice schedules for students who use our methods to get the most out of their study time. This, along with personal interaction with Bruce through email, nurtures the student's ability through a closely monitored situation, ensuring there is no wasted time or misunderstanding.